Darmo- male, yellow eyes, tan and sable- 25 months old. "Darmo teaches us humans a lot- he has behaved like a parent, teacher, and big brother to Zulli, with amazing patience, tolerance, generosity with space and toys, and calmness towards her. Darmo waited two full days after Zulli's arrival in the house (2:00 am Aug 12) in full observation before gently engaging her, keeping still and quiet on those first few nights of Zulli wailing in the crate. On this 3rd week together, Zulli provides Darmo with the daily breathless workout he needs, with Zulli teasing him to chase her all over the fenced property- and plays 'dead' to throw him off. Darmo is the first to check on Zulli when she 'whines'. Zulli arrived taking on the 'sit' position whenever she is not sure of any sound or signal, so we are off to a good start on manners training." In keeping with the multiple dog theme, I love this one. 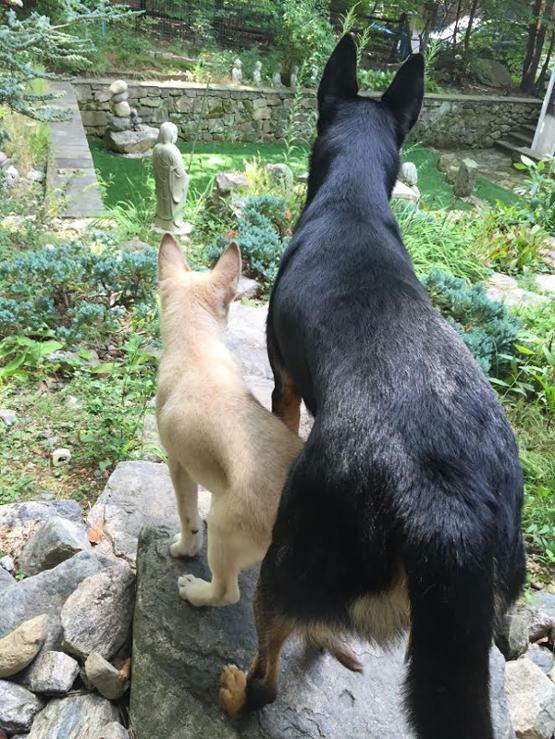 Already a team, and looking out onto the Zen garden; picture/thousand words. Yes! We are standing together looking out at the garden. For this moment, we are all part of their pack. Interests:My biggest priority is being with my family. They are my heart and happiness and my best friends. I love photography. It's one of my favorite things to do. I take tons of high end family photos for fun but also do actual jobs like weddings and what not. I like to read and be outdoors. I love to drink coffee on the swing on a fall day. I'm a laid back, easy going southern girl with her heart on her sleeve. Oh I love seeing these pictures! They're all always so beautiful! Really shows how sweet and majestic these dogs are. What part of Connecticut ? ? Anywhere near Sleeping Giant ? ? I grew up just outside of New Haven area. Your dogs look great.